The Most Reverend Neil Tiedemann, born March 5, 1948, at Peck Memorial Hospital in Crown Heights, Brooklyn, was raised in St. Catherine of Sienna Parish in Franklin Square, Long Island. He attended the Passionists’ Holy Cross H.S. Seminary in Dunkirk, NY; Holy Family Seminary in West Hartford CT; LaSalle University in Philadelphia, PA in 1970 received a Bachelor of Arts in Sociology; and earned master degrees in Theology and Masters in Divinity in 1975 at St. John’s University in Jamaica, Queens. As a seminarian, Tiedemann was involved in outreach efforts with Catholic Charities Brooklyn and Queens near St. Barbara Parish in Bushwick. Bishop Tiedemann entered the Passionist in 1970 and professed perpetual vows on Aug. 22, 1974. He was ordained to the priesthood May 16, 1975, in the Brooklyn Diocese by Bishop Francis J. Mugavero. The bishop’s first assignment was as parochial vicar at Immaculate Conception Monastery in Jamaica, Queens from 1975-1982, where he continued his outreach work with Catholic Charities. Bishop Tiedemann went on to serve at the largely Hispanic parishes of St. Joseph, Union City, NJ, and Blessed Sacrament, Springfield, MA, and ministered in Tegucigalpa, Honduras, where he helped found an AIDS hospice, Casa Pasionista. One of the joys of Tiedemann’s priesthood has been the opportunity to serve the Red Hook, Brooklyn church where his grandparents and great grandparents wed. He served there from 1998 until 2005, and oversaw the 150th-anniversary celebration at the parish. In 2006, Tiedemann was elected to the provincial council of the Passionist Congregation. Two years later, Pope Benedict XVI named him the third Bishop of Mandeville, Jamaica. After eight years serving on the island of Jamaica, Bishop Neil Edward Tiedemann, C.P., called it “a joy to come home” to Brooklyn. Bishop Tiedemann, was installed as auxiliary bishop for the Diocese of Brooklyn in May of 2016. 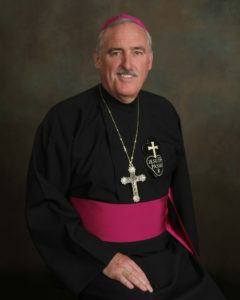 Currently, Bishop Tiedemann serves as pastor of St. Matthias Parish in Ridgewood, Queens and serves as the Director of the Diocese of Brooklyn Ministry to Caribbean and Black Catholics. He is also the titular Bishop of Cova, Algeria.